Don’t you hate it when you buy a new ingredient to use in a recipe only to end up with a big jar of ingredient cluttering your fridge? Me too. I’m a little obsessive about keeping the random jars in my fridge to a minimum… Or at least keeping them ‘quarantined’ in the fridge door. When I get a new ingredient, I go on a ‘mission’ to find ways to use it in other meals, easily, and with lots of tasty discoveries… my type of mission. Hey! I was wondering if you had any dinner recipe ideas for Miso paste. I have tried putting it is a pot with tonnes of vegetables and making a stir fry, then serving it with some rice noodles – it is totally delicious. However I have had this meal a lot (and still have a giant pot of miso paste in my fridge), and I can’t think what else to do with it. Your recipes are always so creative and simple, I was wondering if you had any ideas? It’s a fermented paste made from soybeans. I read somewhere that miso and soy sauce were invented by Japanese monks to add savoury (also called ‘umami’) flavours to vegetarian food. So it’s a super useful ingredient for adding loads of flavour. Miso adds a lovely savoury complexity to a vinaigrette. For a salad for two, whisk together 1 tablespoon sherry or wine vinegar, 2-3 tablespoons extra virgin olive oil and 1 scant teaspoon of miso paste. Or try the recipe below! A super tasty way to take your burgers to the next level. I pinched this idea from fab Sydney chef Dan Hong. Cook your onions in a little butter until soft then remove from the heat and stir in a little miso to season. About a teaspoon or 2 is usually enough… Let your tastebuds guide you. Heat 3 cups stock to a simmer then stir in 1-2 tablespoons white miso. Then add veg, protein and/or noodles to make it more substantial. Enough for 2. To get all those savoury flavours really embedded, use miso in a marinade. Don’t feel like this needs to be an overnight affair. Even 5 minutes can make a difference. A good place to start is to combine 6 tablespoons white wine or mirin or Chinese Shaoxing wine with 2 tablespoons miso. Marinate enough chicken, beef or lamb for 2 people. Pan fry it or BBQ. 5. As a seasoning alternative to salt or soy sauce. Because miso is salty it can be a great way to season and add even more flavour than you’d get from just salt. 6. In a sauce to serve with pan fried meat or fish. I got this idea from Nigel Slater’s latest (brilliant) book called Eat. Cook the meat or fish in a little oil. Remove the pan from the heat and place protein on serving plates to rest. Stir in a tablespoon of wine vinegar, 2 tablespoons white miso and a tablespoon of hot water in with the pan juices and drizzle over your meat / fish to serve. As Beth mentioned, miso is super tasty in stir frys. Because it’s a bit of a delicate flower, best to cook your stir fry and remove from the heat before adding the miso. Which miso should I buy? There are loads of different types and to be honest I haven’t tried them all. I find that the paler the colour, the milder the flavour so I usually buy the whitest one. Also called ‘Shiro’ miso. But any miso can be used in the ideas above, you just may need less if using a darker or red paste. If you can’t find miso or you’ve run out, see my favourite Substitutes for Miso Paste. If you’re in Oz, make sure you make this before corn season ends! It’s lovely on its own but also super tasty as a side to some BBQ salmon or other fish. If you’re in the northern hemisphere, frozen corn will also work but you may need a little more miso to tone down that super sweetness. Inspired by the Lovely Emma Knowles from my favourite food mag – Australian Gourmet Traveller. 1. Preheat your oven to 200C (400F). Pop unpeeled corn on a tray and bake whole for 20-30 minutes or until corn kernels are hot and cooked. 2. While the corn is cooling, scrub radishes and finely slice into coin shapes using a mandoline if you have one or a sharp knife and a steady hand. 3. Mix miso, vinegar, tahini and 3 tablespoons olive oil in a large bowl. Taste and season with salt or extra miso as needed. 4. When the corn is cool enough to touch, peel away the husks and ribbony silks. 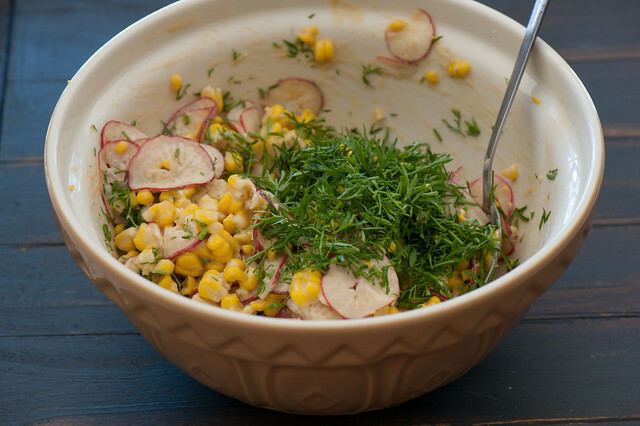 Cut kernels from the cob and toss in the dressing. Discard the husks. 5. 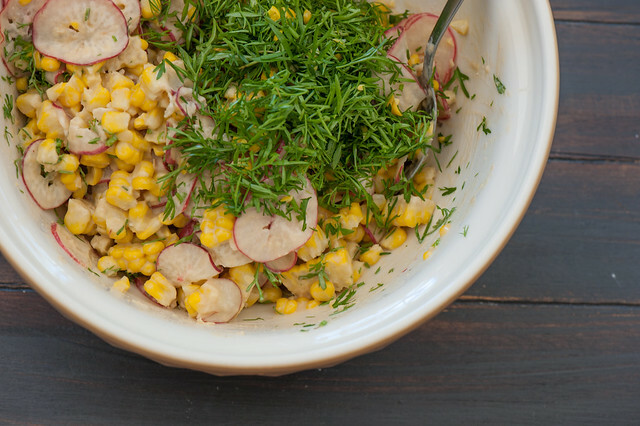 Toss in the radishes and serve with coriander on top. different vinegar – use sherry vinegar, white wine vinegar or champagne vinegar. Apple cider vinegar will also work. frozen corn – pan fry about 2.5 cups corn kernels in a little butter until warm then toss into the dressing. different veg – frozen peas or broad beans will also work. Sliced snow peas make a crunchy alternative to the radishes. carnivore – toss in some crunchy bacon or serve with roast or grilled chicken. different herbs – if you hate coriander try mint, basil or flat leaf parsley or any combo of these. more substantial – you could toss in some cooked noodles to make it more of a meal or try adding some steamed basmati or brown rice or cooked quinoa. no tahini – you could use almond butter or another nut butter or leave it out of the dressing and serve the salad sprinkled with sesame seeds. I LOVE miso, and probably use it at least once a week. I make a lot of Japanese inspired soups with it in the broth (stir through right before serving to preserve the flavour), but also love some nasu dengaku, miso fish (salmon or trout are particularly good, and works lovely grilled or steamed! ), stirred through blanched or steamed vegetables or noodle salad… so many options. It works particularly well for various applications when combined with mirin, soy sauce, rice vinegar and toasted sesame oil. YUM! Great ideas. I have way too many “random jars” in my fridge. Time to figure out similar lists for each of them! It’s a good game to play Jenna! I find its best to focus on using one or two at a time. miso is great! it’s my secret weapon in tofu scrambles, adding umami goodness. i also use it in dressings, gravies, marinades, and peanut (and other various) sauces. Love the sound of peanut and miso together Meg! I love miso too and live in San Jose (CA) JapanTown so have easy access. Love all your ideas on how to use. Most often I stir some miso into a mashed roasted sweet potato; just the right touch of complementary flavor. Miso and sweet potato sounds right up my alley. yum! I mix an avocado with lemon juice, miso, a bit of water & a bit of honey or stevia & have this on loads of things- especially sweet potato fries & my fave, a sushi bowl with black rice, cucumber, salmon, my avo miso mix & coconut aminos, so good! Wow- I’m inpired by Sandy’s avocado-mis0-lemon topping! Thanks for all the great ideas. For me, miso is like Vegemite or Marmite; I crave it when I don’t feel well! To the point of putting it on my breakfast toast! Miso soup doesn’t have to be complex; stir a half-teaspoonful or so into any bowl of soup at your place at the table. One of my favourite ways to use miso is in “misotaytos.” I like to bake or microwave potatoes in their jackets, split them and top with a spoonful of miso paste and a good dollop of hummus! So good! oooh LOVING the sound of your misotaytos Orinoco! Will have to try a few of these, especially the avocado and lemon dressing! Love the idea of your morning miso Sarah! Oops. Just made the corn and radish salad and noticed that in the method, the dressing has 3 T olive oil which is not listed in the ingredients list. Too late now. It’s ready to go. Hopefully we won’t miss it.